In my opinion, the best summer beauty combo is a dazzling white smile and a bronzed glow. Looking tan instantly makes you appear slimmer (an obvious plus), and having clean, white teeth is just a necessity. There’s nothing worse than when your teeth don’t look bright next to your favorite lipstick! Crest 3D White’s array of products are my go-to for eliminating surface stains (like coffee and wine – both I’m guilty of indulging in from time to time), keeping cavities at bay and protecting my enamel. I often switch between the Glamorous White toothpaste, the Lustrous Shine toothpaste and the Brilliance toothpaste for a well-rounded experience for my teeth. When I’m getting ready for a big event, I always use 3D White 1 hour express strips – they work wonders! When I have more time on the weekends, I utilize the Brilliance Boost polishing treatment. You may think that’s way too many products, but think about how much money you spend investing in treatments and products for your skin. It’s just as important to invest in your smile! With Crest’s complete 3D White collection you’ll keep your teeth healthy, shiny and dazzling! For getting that bronzed glow I mentioned, I use a variety of products. For my face I use these tan towels. They’re literally so easy to use (great for travel too) – I just wipe one towel on my face every night before bed until I get the level of tan that I want (typically only takes 1-2 days). After that I just do it every other night. It’s a great base tan for your summer makeup. For a more illuminated look, I add Urban Decay’s Bronzing Beauty Balm to my face as kind of a tinted moisturizer. It has 20 SPF, so even at the bare minimum it is protecting my skin from those harsh rays. After I’ve finished applying most of my makeup, I may dust on some of my favorite bronzer (depending on how tan I want to look). For my body, I start with Jergen’s Natural Glow Firming lotion. Just like with the tan towels, you use it every day after showering until you reach the level of tan you want. For me it only takes about 3 days for the color I want to appear. Before going out, I’ll also apply Urban Decay’s Body Beauty Balm which adds more immediate color and just a touch of shimmer. Every once in a while, I’ll pull out Sally Hansen’s Airbrush Legs spray – I usually only do this for special occasions because it’s just not that easy to apply evenly (takes me a while to get it right!). When done well, it actually does look like your legs have been airbrushed – they look more defined and have a beautiful bronzed glow. This spray comes in light glow, medium glow, tan glow and deep glow. It’s also a great product for hiding those unwanted veins, scars or other unsightly skin issues. 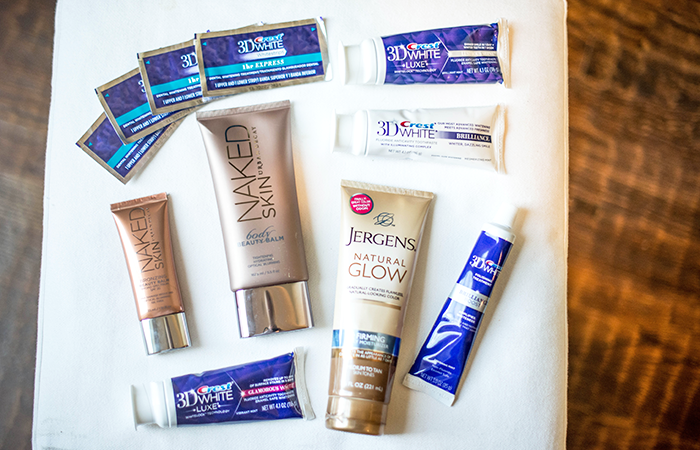 Shop all of my favorite tanning products and the whole Crest 3DWhite collection below! yes, white teeth and a faux glow/tan are definitely imperative. These are ALL definite must-haves for me as well! I love white strips… They are always a life saver! I use the Jergen’s lotion every day as well. Drug store finds are the best! Have a great day, love! I’ve been so curious about that 3D White. Couldn’t agree more! Hope you have a lovely holiday! Thanks for the tips, because I’m in desperate need of a tan! I just started the white strips and already love them! Have a great long weekend!